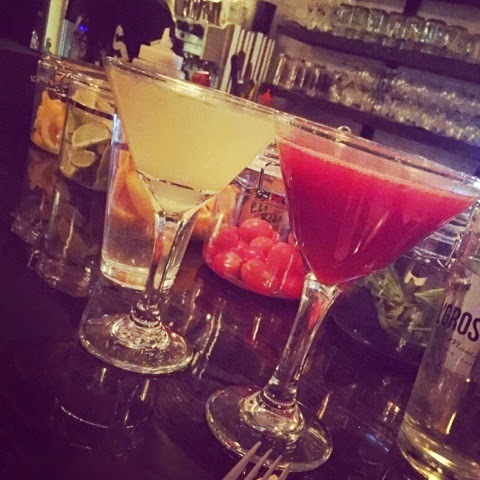 L&#39;Gros Luxe - dinner at the bar is always better!! L'Gros Luxe - dinner at the bar is always better!! Grilled cheese, poutine, fish ‘n chips, what more could one want to accompany a damn good drink on a girl’s night? That is exactly what my best friend and I were hoping for on our last girl’s night before her husband returned from a business trip. We both had heard all the buzz about L’Gros Luxe and decided we had to head over and try it out for ourselves. We decided to stop by the Bernard location and quickly grabbed two seats at the bar. We love sitting at the bar, not only is it fun to chat with the people sitting next to you, but the bartenders always make the night that much better. This night, we had two very entertaining men to the left of us and had a blast debating what to order with them. First things first, we had to order drinks! I started the night with their “Brody Dalle,” a gin cocktail with Campari, lime syrup, raspberries and basil. My friend had “Le Pickle,” a gin martini with a dose of dill pickle juice. Both drinks were strong but still delicious. Despite having a tad too much pickle juice, my friend still enjoyed “Le Pickle.” Her only comment as she sipped her martini was thank goodness she loved pickles otherwise this drink would be awful. My drink was bitter, sweet and delicious, just the way i like it. We then ordered up what we thought was going to be a feast. We had the evening special, tater-tot poutine, and crispy fish tacos. The plates arrived quite quickly and we both started to eat. The first thing I noticed was how small everything seems to be. 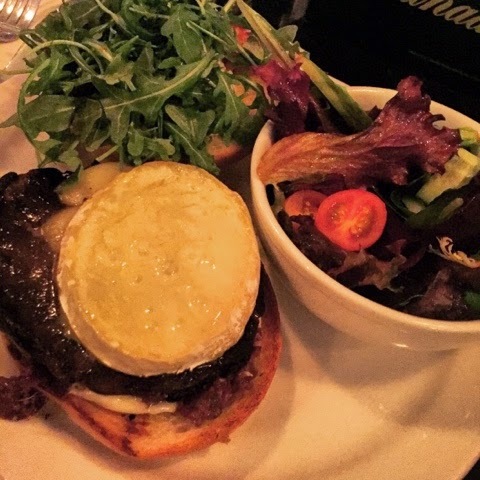 The special that evening was a Portobello mushrooms slow-braised served on a brioche bun with an olive tapenade, melted brie cheese and arugula. My friend and I had decided to share everything and as I bit into my half of the Portobello burger I had high hopes for this meal. The Portobello was tender, flavourful and absolutely delicious. Paired with the melted brie, saltiness from the olive tapenade and fresh peppery arugula, this burger was really damn good. The side salad lacked a lot to say the least. Flimsy mixed lettuce, one little cherry tomato and maybe there was a dressing, but I definitely did not taste nor see any. Oh well, I thought, I definitely did not come to have a salad. 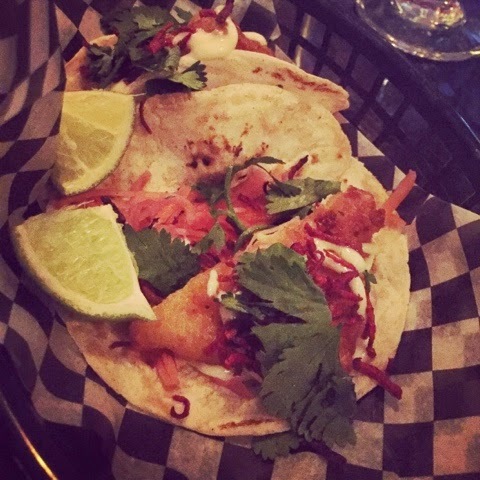 Next we sampled the fried fish tacos. First thoughts, where are the tacos? When I say there were small, I mean they were tiny. Literally a two bite taco – no joke! That being said, they were only $2.50 so I really didn’t have a real complaint. As I bit into the taco all I tasted was fried, no other flavours at all. No lime, no cilantro no taste of miso mayo and definitely no pickled veggies, nothing but fried. We were both shocked and disappointed. The cod was cooked perfectly though, tender and flaky with a nicely crispy fried crust, but no flavour whatsoever. 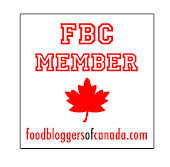 The tater-tot poutine was the one dish I had heard great things about and I was eager to taste it for myself. 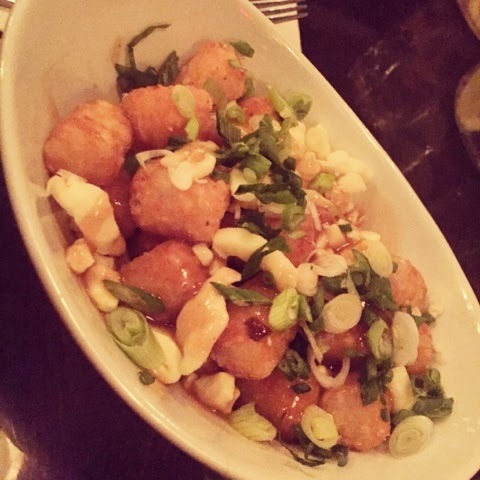 At first glance the dish looked perfect to me; cheese curds, crispy tater-tots, green onions and a perfect portion of gravy smothered all over. The tots were still very crispy and not soggy which I really enjoyed, but I found the gravy to be lacking flavour. The green onions were a nice touch but very overpowering, there were way too many of them. A small sprinkling would have been sufficient, but with each bite all I tasted was green onions. Again, we were both a little disappointed with this dish, but loved the idea behind it. As we finished our first round of drinks, we ordered another. This time I went for the “El Diablo” a tequila cocktail with lime juice, triple sec and Pimm’s No 1 gingerale. This drink is now my favourite. Crisp, refreshing and absolutely delicious, I loved this drink! The perfect balance of tequila, gingerale and lime – outstanding! My friend had the “Madame Luxe,” a gin cocktail with Lillet, basil, cucumber and soda. She too thought her drink was divine, and it was. As we sat chatting with the fellows next to us, my friend was completely unsatisfied and wanted to order something else to eat. We decided on the plain grilled cheese and fries. The guys next to us also felt the need for something else and ordered up another dish. The grilled cheese arrived and damn it was good. The perfect blend of cheeses, crispy not greasy bread and delicious fries, we were both finally satisfied. The guys too seemed to enjoy whatever it was they ordered. Of course by the time the grilled cheese arrived I was too tipsy to remember to snap a pic, you'll just have to imagine it! 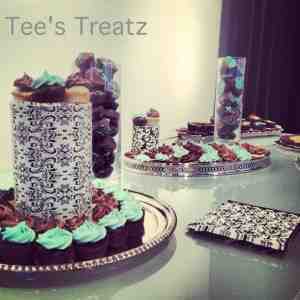 Then it was time for dessert, not being a huge dessert lover, I let my friend choose what we should get. 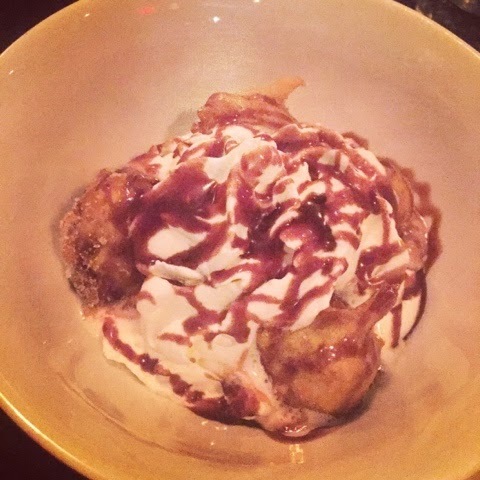 Deep fried cookie dough, of course! A slab of cookie dough battered and deep fried, what could go wrong? Well to me, everything was wrong with this dish. The fried battered was awful and the cookie dough was mushy – not for me at all! 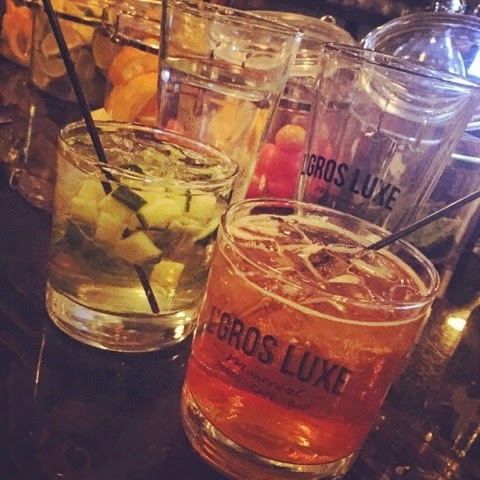 We had a fun evening at L’Gros Luxe, and I will definitely be back for more drinks, but the food wasn’t too spectacular. There is so much potential, just needs a little tweaking.